The Bubble Rush was a real winner in 2018, and the 2019 Bubble Rush promises to be bigger and better! Register now! Fancy flinging yourself into fields of fabulous foam? You can with the Bubble Rush! It's a 3k course with four Bubble Stations pumping out huge amounts of brightly coloured foam - blue, green, yellow and pink. It's not timed, so just enjoy running, walking, toddling or even dancing through the environmentally friendly clouds of bubbles. There's no age limit, so the whole family can have fun rushing through the bubbles! 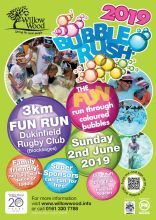 Why not join us at Dukinfield Rugby Club, Birch Lane SK16 5AF - the Bubble Rush starts at noon, although we do ask that you check in with us from 10am onwards. There'll be plenty going on with fun, stalls, music and a warm-up session! To guarantee your place you must be pre-registered for the Bubble Rush - sign up online now. Prices are £20 for adults and £10 for 3-15 years. Children up to 2 years go free! Registrations will be available on the day, but these may be at an enhanced rate. All paid entrants will receive a special Bubble Rush T shirt and a colourful medal at the end of the event. Once you've registered please download your Sponsorship forms here and you can also view the Terms and Conditions and FAQ's. By doing this, you are saving us the cost of postage, and ensuring that even more of your sponsorship goes to help care for local people. We hope that you can each raise at least £50 in sponsorship - we can help by providing one of our fundraising cards - email fundraising@willowwood.info for details. And if you raise £120 or over we class you as a Super Supporter - and you can get your registration fee returned! Still not convinced - watch the video - it's Bubbletastic!